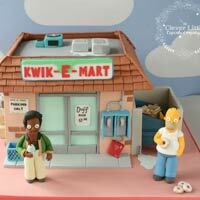 Simpsons Kwik-E-Mart cake is a creation of Amanda Mumbray, a baker and owner of The Clever Little Cupcake Company in Bury, a town near Manchester, England. The cake is a detailed recreation of the convenience store, with dual pay phones, an “El Barto” tagged dumpster, and empty boxes completing the scene. “The Simpsons is the longest-running American sitcom, the longest-running American animated program and the longest-running American scripted prime-time television series.” That’s incredibly impressive, and if you’re into television or comedy at all, even in the slightest bit, you’ve seen The Simpsons at some point in your life. For that reason, this iconic TV series deserves to be celebrated for years to come, and in multiple ways. Since Homer loves doughnuts, why not celebrate with a dessert? Could you really let yourself eat this? It’d be hard to break this work of art down, just to fill a sweet tooth.